I saw this drawing on Instagram the other day. I don’t know where it originated, but I love it! I’ve really found working with my horses at Liberty a valuable tool. But when I say liberty, I mean the horse is free to make the choice, and that’s where the value lies. If they don’t choose to participate in what I’m doing, that gives me a lot of information about how comfortable they are, and how rewarding they find whatever it is I’m doing with them. Then it’s my job to find another way to become more engaging and rewarding, or to make them more at ease, so they DO want to play with me. If they walk away from me, then I know they’re comfortable to do so. It’s a good thing, certainly not something to be discouraged by chasing or correction. There are a couple things that are sometimes called “liberty training” that I don’t include in my definition. First, chasing a horse around to frighten or encourage them into an expressive trot is not liberty training. 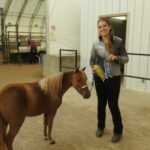 Yes, there are horses who love liberty class at the show, and that’s great. It’s a fun opportunity for them to get out of their stall and blow off steam, but it’s not training. It’s a bit of fun for the horse who enjoys it, and either tedious or frightening for those who don’t. Second, and much more importantly, a horse who has no tack on, but doesn’t feel like he has any choice but to do as he is told, is not at liberty. 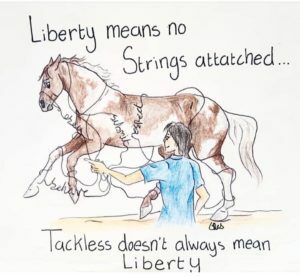 Skills that are taught using tack or whips or other forms of restriction, and enforced through threat of consequences, are not liberty training, even when the tack is removed. 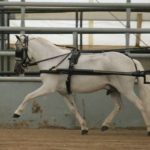 True liberty training improves your relationship with your horse, not your control over them. 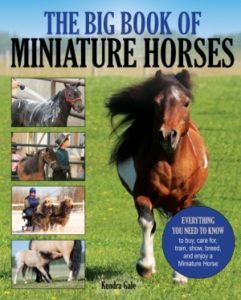 Hi,I think liberty training for mini horses,ponies and horses should be a choice that they want to make with their owners with no pain,discomfort,no forcing something that they don’t want to do if they are under tack,harness or longe line etc. 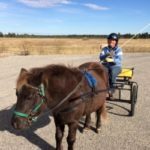 The miniature horse,pony or large horse have to want to play at liberty with their owner or handler. I used to farm sit for a couple who had a thoroughbred horse mare and her foal that i took care of as well as some other farm animals while they were away for a little while,and the foal wanted me to play with him under his mom’s watchful eye.The foal would fetch his ball with a handle on it and i would through it in the field and he would go fetch it like a dog and we would do that until mom told me that was enough playing with her son or her son would no longer play with me. The foal would through the ball over to the fence to the cow on the next door farm but the cow wouldn’t play with him which got him upset.The two horses in the other field would play with him but his mom got upset at them but not at me. I groomed the horses and the foal,fed/watered them and gave them hay too. Sometimes i would walk over the poles and i asked the mare and foal if they wanted to play with me and they followed me over the poles and two barrels until the mare had enough and went back to her grazing.But the foal enjoyed playing with me and never did he rear up,kick or bite me,he was happy to have somebody to play with. When the owners came back to their farm their house was clean,the horses stalls and fields were clean and the horses were grooned etc,and they watched me playing with the foal walking over the poles,barrels all by himself and they were impressed with him and i that day in bc. Liberty training does work if done properly etc. 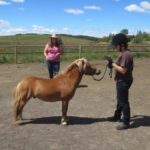 What do you think of clicker training and team touch and ground exercises with mini horses?could you please work on videos about these topic training methods during your training sessions with your miniature horses when you have the time to do so kendra?